You are here: Home » Join our Suffragette & Day of the Girl celebrations! 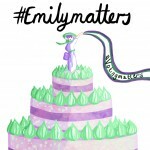 #Emilymatters is a social media campaign to support and advance gender equality, particularly focusing on the importance of voting. See our #Emilymatters page to find out more about what we do. On the 11th October 2018, we have a very special celebration in honour of suffragette Emily Davison’s birthday and the UN Day of the Girl. Sign up to our #EmPawa event newsletter to find out more about how to get involved and be part of the story! We are excited to be partnering with PAWA, an innovative charity with education and empowerment at its heart, whose sole focus is on supporting teenage girls’ education in Asia. Both PAWA and #Emilymatters celebrate Day of the Girl as part of our outreach work and this year we have come together to highlight the #vote100 anniversary and the importance of the education and empowerment of women and girls today. It promises to be a unique event, which is both site specific and interactive (using social media). Wherever in the world you are, you’re invited! When registering for this event, your information will be shared with #Emilymatters and PAWA so they can manage the event. You will be given the opportunity to “opt out” after the event. Your information will be kept secure and not shared with any other organisations. Emily Davison was born on 11th October, 1872, a date which she now shares with the UN’s Day of the Girl, Given this year is the 100th anniversary of the 1918 Representation of the People Act, which gave some women (over 30, who met a property qualification) and all men the right to vote. It took another 10 years before women had equal voting rights with men, just as today where inequality around the world continues to persist, damaging the life prospects and happiness of millions of women and girls. 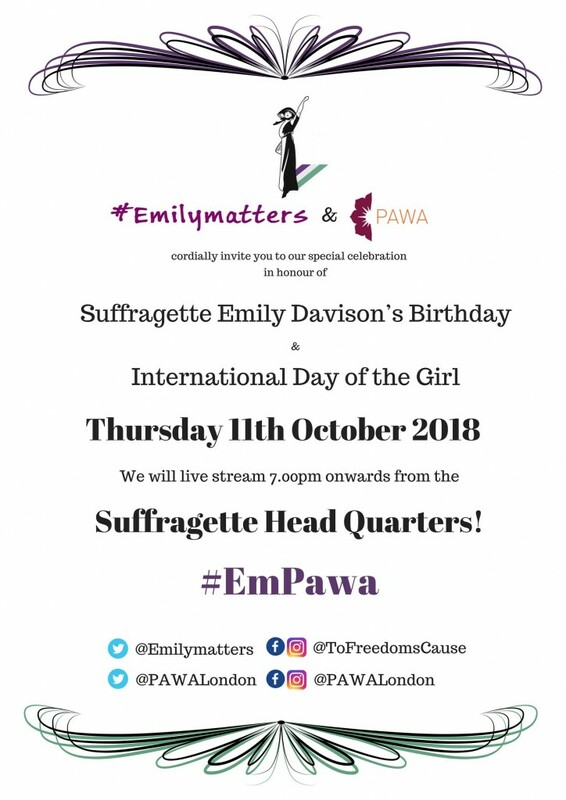 This is why #Emilymatters and PAWA will be both celebrating progress made as well as discussing how we can all address this global issue, on Day of the Girl and every day! Help us do phenomenal women and girls proud and let’s celebrate in style! how you can get involved and be part of the story!